At Best Practice Investigations we provide experienced, professional investigators to the legal industry, business sector and to assist and support the needs of individuals. We are investigation experts with a policing background which we evidence in our professional values and methods. We seek to bring the best practice of policing into the private sector. The company was set up by our Managing Director following a Detective career in the Metropolitan Police. We look to provide cost effective solutions to assist you in finding that piece of information that you need. We pride ourselves on our customer service levels and often overlooked in this industry we pride ourselves on our ability to communicate with you, our clients. We will ensure that we understand your needs and expectations. We will then ensure that we manage your expectations throughout our business relationship. We will also ensure that you are fully aware of the appropriate costs throughout so that there are no hidden charges surprising you at the conclusion. Contact us and discuss your requirements. There is no size of job that is too big, nor too small. We could be the most important phone call you make this year! We are here to help you find that missing piece of information that you are either unsure how to find, if you can find or where to find. Call us today whatever your enquiry may be in relation to. No enquiry is too small or too large and we will be able to advise and assist you from the outset. Our services are varied, a selection are shown below, but this is by no means exhaustive, so please pick up the phone and call us to discuss your needs. Business support - covert surveillance, staff checking, Risk Assessment, Crime Reduction, Risk Management, mystery shopper, tracing absconding debtors. Business intelligence - due diligence enquiries, competitor intelligence, financial investigations, fraud enquiries. Solicitor support - finding missing persons, process serving, tracing beneficiaries, probate enquiries, litigation, evidence gathering. Background enquiries - post employment investigations, staff vetting, background checking, CV checks, pre-sue status enquiries. Claims support investigations - accident in the workplace, fraudulent insurance claims, life insurance enquiries, Road traffic investigation, locus reports, advanced interviewing, witness statements. 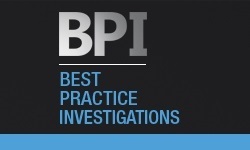 Best Practice Investigations are based in Staffordshire. We operate throughout the UK, and are able to undertake international work when required.